Four hundred years ago a creature descended upon the Earth. The supernatural hunted innocent lives wanting blood and vengeance. Two families, the Wynters and the Chelseas, knew of the darkness that reigned over the world. For thousands of years they hunted and killed to protect those who knew nothing of the dangers. 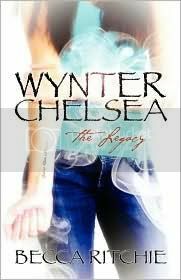 Amanda Chelsea vies to be a part of the Wynter Chelsea legacy, constantly craving the thrill of a lifetime that her older brother, Jack, and the two Wynter boys experience. At seventeen, Amanda’s passion to fight is overwhelming, and she cannot come to grips with why the boys are protecting her. Abilities are cast upon the new generation of Wynters and Chelseas, only in hopes of guiding them to vanquish the impenetrable creature. Even as Amanda Chelsea receives the power of empathy, feeling other people’s emotions, it brings more harm than a vital potency. Through the turmoil in New Jersey, Dustin Wynter is the only one able to relate to Amanda with a similar gift. As Jack’s rage boils over the edge, Dustin must put the pieces back together and hold the legacy up with a shaking arm and a quirky brother by his side. When the world couldn’t seem to become anymore dangerous, both parents of each family go missing. Now with no choice but to bring Amanda along, she finally is able to fight without hassle, but is it worth it? Is the disappearance of the ones she loved a price that she has to pay for her dream to join the legacy? Traveling across the United States, the four young adults must confront their hidden emotions and ultimate reason for living. The world Becca Ritchie created in Wynter Chelsea: The Legacy is filled with action, suspense, paranormal creatures, and a little bit of romance. She wrote this book when she was just fourteen, and I have to say, she did a pretty amazing job with it! The storyline was interesting and well written. I loved getting to know all the characters, and reading about their ‘gifts’ and their demon hunting situations. (There was never a dull moment for the Wynter and Chelsea families!) I really, really enjoyed reading this book, and I’m looking forward to checking out the second book in the series to see what happens next! Thank you to Becca Ritchie, for contacting me to review your awesome book. I really enjoyed it! Great review...I'm adding it to my TBR pile. You really made me interested in it by the detailed review. Thanks much and have a great weekend! I need to sigh and add this to my TBR list like everyone else. It sounds like a great story. Thanks for stopping by my blog. I'm a new follower here now. Follow Friday #10 & Book Blogger Hop #9!